who says you have to be crowded into the living room, kitchen, and/or dining room to hold a book club? we are ladies of the 21st century. we don’t need no stinkin’ couches. so pull up a blog and join in the conversation. 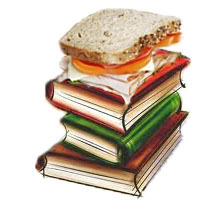 the members of the BOOK HUNGRY are (alphabetically): patty blount, kelly breakey, karla nellenbach, vanessa noble, alyson peterson, cynthia reese, elizabeth ryann, and myself. here’s the deal. we pick a book to read. we discuss via email. we post a review on our individual blogs on the same day (3rd thursday of the month). we link to each other. done. i know, genius. click on each one of their names (above) and it’ll take you to their review. browse. enjoy. what it’s about (from IMDB because amazon had reviews only, no summaries): Rescued from the outrageous neglect of his aunt and uncle, a young boy with a great destiny proves his worth while attending Hogwarts School of Witchcraft and Wizardry. my opinion: this was not the first time i’ve read this book. this was not the second time either. it was probably somewhere along the lines of my fifth read and while nothing can capture the magic of reading this book for the first time (ah, sheer bliss! 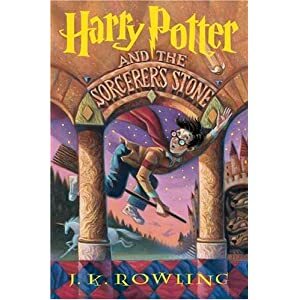 ), the fact that i have read it no less than five times and can still be completely sucked into the story is a testament to rowling’s genius. it’s hard to write about this book, this very first one, without revealing any spoilers to any of the other books because the entire series weaves together so seamlessly sometimes it’s hard to remember which is which. it all seems like one gigantic (and amazing) story that you never want to end. although, you know what? it was actually kind of fun to be rereading this story because it’s been years since i last read any of these books and even longer since i’d gone back to the very beginning. i’ve been with these characters for seven books and i’d stay i’ve gotten know them quite well, so to go back to their roots was a treat. i found myself giggling over the initial introductions of neville and hermione and cringing from the poisonous snape and feeling safe anytime dumbledore walked onto the page, gasping over the magical revelations, and most of all, still rooting for harry, ron, and hermione. these characters are some of the most fleshed out i’ve ever read and as such, these books, THIS BOOK, never fails to entertain and with each read, the magic comes alive just like it did the first time i read it. that’s the mark of a true wizard. This entry was posted on September 22, 2011 at 8:00 am and is filed under book club. You can follow any responses to this entry through the RSS 2.0 feed. You can leave a response, or trackback from your own site. Absolutely. Rowling has been working her magic on my since Book 1.
i started reading these when i was in college (the first 3 were already out) and i distinctly remember thinking “this. i want to write this (MG, YA). and thank you, Rowling, it’s now okay to do so.” her magic overfloweth my cup. or, yeah, something. i’m so glad this was a choice for the group. it truly was a treasure to re-read. I am sure I will enjoy it as I enjoyed the movies very much but haven’t seen them in a while. Promise to let you know when I get it read so we can discuss. aw, kelly. waiting until the digital versions come out? i just heard they’ve been postponed……you’re going to have to wait so long! and while these books ARE worth the wait, they’re also worth reading immediately if not sooner!! but in any event, i will still be here ready for discussion once you’ve finally gotten your hands on them.